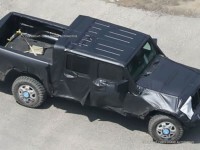 Post Tagged with: "2019 jeep pickup"
After years of speculation, a Jeep Pickup was recently spied testing in a crew cab configuration. With Jeep’s legendary off-road prowess likely being added to this truck, it just may be a true off-road competitor to the Toyota Tacoma. Yet, will it really compete with the Tacoma’s off-road capability?